Ring in Christmas Eve, Christmas Day and New Year’s with a sweet or savoury Italian potato donut also called Zeppole, Cullurielli, Cuddruriaddi, Grispelle, Graffe, Ciambelle, Culluraci or Colluri depending on what part of Italy you are from. I’m pretty sure you will find even more traditional names for these delicious fried potato donuts. Zeppole in Italy is a traditional fare that is served on Saint Joseph Day March 19 and during the Christmas and New Year’s Holidays. Last week when I posted my Thai Fish Cakes recipe which is also a great New Year’s finger food I mentioned our mates Marco and Christina and their famous Italian recipe for savoury potato donuts. Being British and all I joke around and call them spudnuts donuts just because that’s what we call potatoes in the UK. I turned their zeppole donut into my Zeppole Spudnut based around the same concept adding my own flavours. Since moving to Canada and being exposed to Tim Horton’s and the famous Boston Cream donut I always wondered; how do I make donuts? It can’t really be that difficult and with the myriad of donut flavours available you can’t go wrong with a homemade donut recipe. From what I understand there are 2 types of donuts a cake donut and a yeast donut but heck I’m not a donut connoisseur. Is a donut a cake? Well when you bite into a Boston Cream Donut for example that is a yeast donut which is light and puffy. When you bite into a sour cream glazed donut that is a cake donut. The textures are very different in the mouth and for me they both appeal to my sweet desires. When Christina and Marco introduced us to this incredibly odd mashed potato donut recipe we thought, ah what the heck and we tucked in. Surprisingly they are amazing! Their donut is crispy on the outside and light and chewy in the middle. They don’t have to be a sweet donut like the one I will show you today although I have tinkered with the thought of making a baked sweet potato donut. Every time we go to Marco and Christina’s house for dinner we know they will fill the table with Italian food dishes that simply amaze us. You can make a few variations of this Italian fried donut all of which we’ve tried and enjoy. There is also the sfinge which is a baked cream puff also called zeppole. 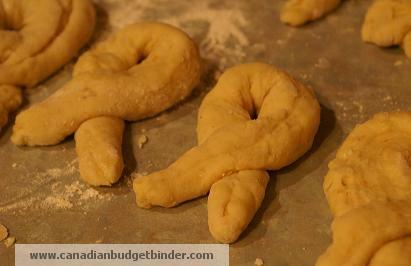 Below are photos of the plain zeppole potato donut which you can keep savoury or roll in granulated sugar. Using the plain recipe for zeppole potato donut make a long straight donut, flatten and fill with an anchovie then close it over before deep-frying. Simple. Donut frying is likely one of the reasons many people shy away from making homemade donuts. Frying with oil can be scary but not if you are prepared and take your time. Always think safety first if you are deep-frying and keep all water away from hot oil. These donuts are best served piping hot then rolled in granulated sugar or left plain. We have also taken the dough which we made ahead of time and froze it for a later occasion. On a clean surface add 4.5 cups of flour,2 cups sugar, baking soda, baking powder, cinnamon, nutmeg and salt. Mix them around to combine then make a well. 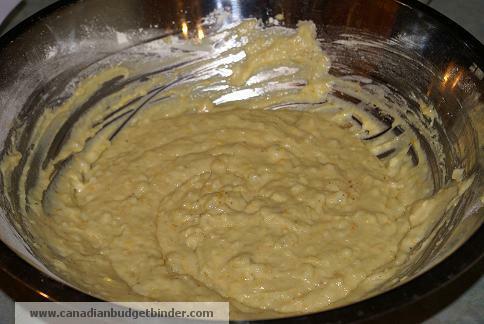 Add the wet ingredients into the middle of the dry and start combining the wet and dry with your hands until it forms a soft dough. 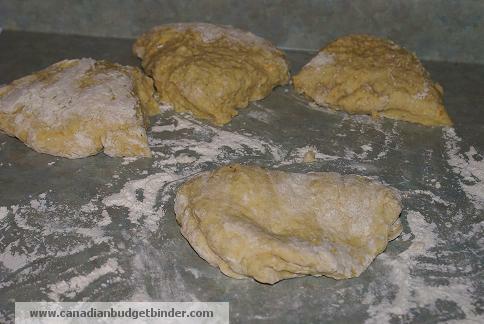 Add more flour if you need to as you have 5 1/2 cups but may not need it all. You do not have to knead the dough yet. 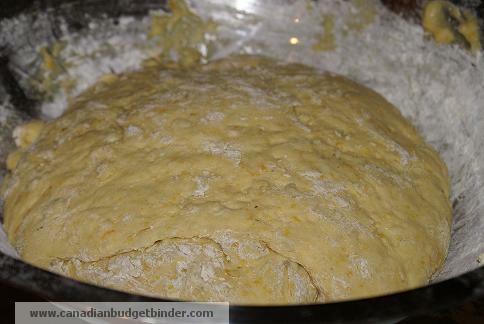 Turn the bowl onto a floured surface and divide it in half or quarters and knead the dough. Start to rip off balls of the dough and roll it on the floured surface until you make a 1 inch rope like shape then twist it to form a ribbon, or leave them as balls or form them into a simple round donut. It’s up to you. Frying takes just a couple of minutes or until golden brown. I suggest timing cooking one then tear it open to make sure it cooked all the way through as everyone has different stoves and deep fryers. As soon as they come from the oil toss them into the big tin foil lasagne pan filled with your granulated sugar to coat. Shake off the excess sugar from the donuts. You can make the same recipe without the orange, cinnamon and nutmeg for a plain zeppole Italian potato donut that is crispy and chewy as you will see from the photo above. You can store the zeppole potato donuts for a few days under a tea towel so you keep that crispy outer texture but I’m betting they won’t last long. You can also freeze them up to 3 months. I’m definitely a cake donut man. Blueberry old-fashioned donut is always my first choice. As far as mashed potatoes, my great-grandmother always made the best ones. 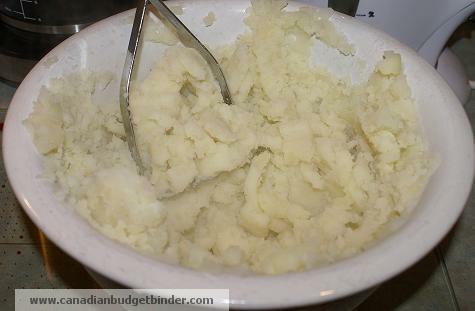 They were “lumpy” (my name for them as a child), but what she did was separate out some of the potatoes before she mashed them and used those to only cut into cubes and then mix them back in. This looks like my favourite thing you have made so far. It looks similar to chirros. Thanks mate, What are chirros Glen? I am in donut heaven. Nom nom nom. It always is such a pleasure to stop by and indulge in your tasty midnight picture snacks. Happy New Year, Mr. CBB, sir! Should I eat these before or after my Weight Watchers meeting? You can do what you like.. just like the budget and $$ you are in control of what you put in your mouth!! Happy New Year mate! They look good!! !, I’m not fond of deep frying things but…… I do find it funny that you will mention using a ricer for mashing potatoes… I’ve used one since I was a kid and my Mom used one all her married life…. But when ever I mention ricers to other people I get the blankest looks from them including my sisters-in-law, so I have to explain to all just what a ricer is and how it’s used.